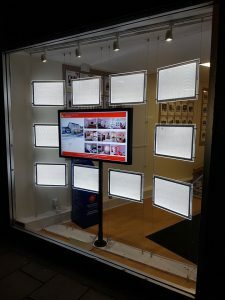 After asking us to supply and fit LED window displays and a digital media player at their new office in Kelso a few years ago, our customer decided to upgrade their window displays in two more offices. As both offices are in prime locations, they wanted to maximise advertising using digital displays. So to combat the bright sunlight, which often reduces the visibility of window digital screens altogether, we recommended our High Brightness range to our customer. The High Brightness screens guarantee excellent visibility, even when faced with bright sunlight, and sunlight reflecting off of the window glass, ensuring our customer has a powerful, illuminated and professional window display at all times, which is essential for them and their customers. Or if you prefer, simply opt for the basic screen option, of Plug and Play – update the screen easily by uploading your content to it by USB drive, unplugging the USB drive, and then leaving it to run as you have scheduled it – and you can also enjoy a 3 year warranty and lifetime technical support. Our customers have enough to manage, without being left to deal with the technical issues or faults of items installed in their windows. This is why we can proudly offer these outstanding guarantees, as well as a free and friendly technical support service, which is proving to be very very popular with our customers, helping them to make the most of their window advertising space, but without all the time-consuming problems that this would otherwise entail with other systems. 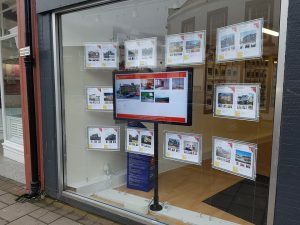 Combined with out high quality LED Light Pockets, our High Brightness media screens are an excellent investment for estate agents or anyone else who wants to maximise the advertising potential of their High Street window. No more waiting for posters to be printed, or paying printing costs. Use your own creativity to present dynamic and immediate, unlimited digital advertisements. 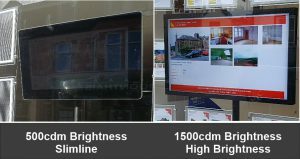 If you’re considering a digital advertising screen in your window, please consult us. The benefits can be fantastic, but you need to ensure it is managed properly, or you could end up spending thousands of pounds on a completely wasted project. 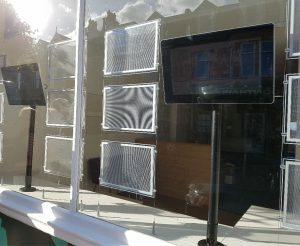 Below is an image of a screen which we installed for another supplier. The customer ordered their products online, and we were instructed by the supplier to install as advised, despite our concerns. If the customer had come to us directly, we would have advised them against wasting valuable investment funds on something that would prove to be useless in daylight hours. We often find that we are installing over-invested displays for companies that have used an online supplier, who then instructs us to install. We would have saved many of these companies thousands of pounds, as well as ensuring they had a relatively carefree window display for the foreseeable future. Even tilting the units was little help for this customer who invested several thousand pounds in this one window alone. Digital screens aren’t always the answer. 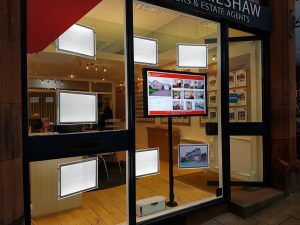 But they do offer excellent advertising facilities, so if you want to maximise your window space with digital advertising, you must ensure the screens are capable of delivering. They MUST be visible !. As our High Brightness screens are. Remember – they are not only temperature controlled, they also come with 3 years warranty AND free lifetime technical support ! This is a service which our current customers love ! Please, please contact us for help and advice. We want you to get the best out of your budget. We don’t want you to be contacting us further down the line because you’ve wasted your long term budget on a supplier who has little experience and no concern for your own situation. We can offer you the best of advice, the highest quality products, and save you 60% of the budget that other companies will demand from you as they sell products at you, instead of giving you the best advice. Let us help.